If “hyaluronic acid” sounds to you like the last thing you’d want to put on your face and “ceramide” makes you think of pottery, you’re not alone. Unless you studied product labels as your foreign language of choice, it can be tough to figure out what all those science-y terms mean. Below, we break it down to the basics, highlighting five common skin care ingredients you’re bound to run into — and exactly what they do. What it is: A naturally occurring substance in the human body that regulates cell renewal, lubricates connective tissue and maintains skin’s moisture and elasticity. What it does: When used topically, hyaluronic acid creates a moisture barrier on the skin, helping to make it smoother and softer. This ingredient is able to hold up to 1000x its own weight in water, thus producing amazing benefits for dehydrated skin. As an injectable, hyaluronic acid works as a plumper, filling wrinkles and fine lines. Because it is already naturally present in our bodies, hyaluronic acid is a safer alternative to synthetic ingredients and is less likely to be rejected as a foreign substance. The molecule, however, is quite large and can’t fully penetrate the outer layers of the skin to fill wrinkles when used topically. 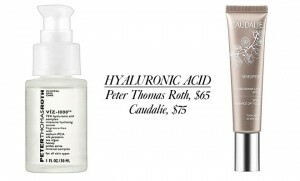 Try: Peter Thomas Roth VIZ-1000 75% Hyaluronic Acid Complex ($65, sephora.com); Caudalíe Vinexpert Broad Spectrum SPF 15 Radiance Day Cream ($75, us.caudalie.com), Juvederm (find a doctor at juvederm.com).